From afar it sounds like a typical rock band performance: Bass guitars, drums, loud singing. But as one slowly approaches the scene, an unfamiliar image is revealed. Six girls in modest clothing are standing on the stage, some wearing head covers and one nine months pregnant, while the entire audience is comprised of women. Meet religious rock band Ashira. Three years ago flutist Yael Taitz, 25, and violinist Pnina Weintraub, 24, two friends studying together at Bar-Ilan University, decided to start a religious rock band. "The idea was to create awareness and culture and raise a genre which does not exist in the religious sector," says Weintraub, who is married and studies therapy and music at BIU. For a long time, the two held auditions for religious female musicians, and eventually found Maayan Schweitzer, 23, Hagit Tawil, 29, Inbar Perser (Gessner) and Lia Bagrish, 22. After two years of performing in front of seminaries and schools for girls and women taking part in the national service program, they began creating their own music and writing music for texts from the Bible and lyrics they write themselves. "It's fun singing holy songs and doing this special thing we’re doing," says lead singer Hagit Tawil. In the past year, after gaining experience and female fans, the girls began performing in pubs designed for the religious sector and in larger auditoriums as well. This Tuesday, for example, they are expected to hold a major performance at Bar-Ilan. It should be noted that men are banned from all of their performances due to Jewish law, which rules that "the voice of a singing woman equals lewdness." "There is a halachic problem for a man to listen to a woman's voice, and we are strict about this," explains Weintraub. "If we hadn't been singing there would be no problem for a man to be present, but it's a matter of modesty. Once even my father came to a performance and had to wait outside." Despite the strict rules, there is still one man who can be found among the audience – the soundman, who stands behind the stage. According to the girls, he may also be replaced by a woman soon. They are also looking for a producer who will help them record their first album. Three of the band members are already married, and the other three are still waiting for a groom. "At the moment I'm single. When I do have a boyfriend, he won't be able to watch my performances and will have to settle for a CD of the band's songs," says drummer Maayan Schweitzer, who lives in Petah Tikva and studies psychotherapy at Tel Aviv University. Tawil is also still looking for her sweetheart, and the band's success will not necessarily help her reach her goal. "We don't have so many opportunities to meet boys because only girls come to our performances," she says, "so on this level the band is not likely to bring the next boyfriend." As they cannot attend the gigs, the girls' partners must settle for listening to them and supporting them from afar. "I am curious to see her perform together with the other girls, but if I work to realize my curiosity I will be damaging what this band represents," says Baruch Weintraub, 25, Maayan's husband and a hesder yeshiva student. "I think she does important things from a public and cultural point of view, and on the personal level it gives her enjoyment, satisfaction and a way to develop." In recent performances fans were able to detect the growing belly of Yael Taitz, who is nine months pregnant. "It's interesting performing on stage while being pregnant," she says. "Sometimes I feel a kick in the middle of the gig, and I believe I am enriching the fetus' musical world this way. "God willing, after I give birth I plan to take a month's break and will probably miss one of the performances, but I'll have to return immediately afterwards. My mother has already promised to babysit when I have to go to rehearsals and performances." 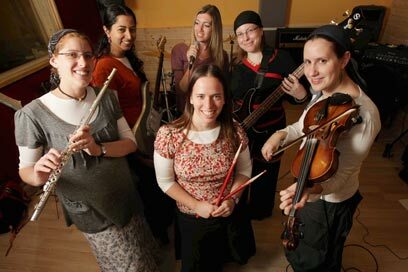 See all talkbacks "Introducing 1st religious women's rock band "